Greetings out in bloggy land, and happy new year! We always have some family birthdays we celebrate on New Year's Eve as well, and this is a card I made for my uncle (one of whom we celebrated) that night. I love the sketch from Tuesday Morning Sketches and I think it worked well with this image. Supplies are from a card kit, but I added black Stickles, and the DCWV shimmery onyx cardstock, and Real Red cardstock from SU. 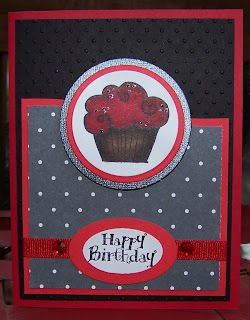 I used Nesties, Cuttlebug Swiss dots embossing folder, and the Creative Memories wave cutter also. Adorable birthday card! Thanks for joining us at Tuesday Morning Sketches. I really like this black and red...great man card! Critter Monday - Sketch Time!